Lochen Gyurmé Dechen is one of the biographers of Drubchen Thangtong Gyalpo. He was a descendant of the Mahasiddha in the maternal lineage. 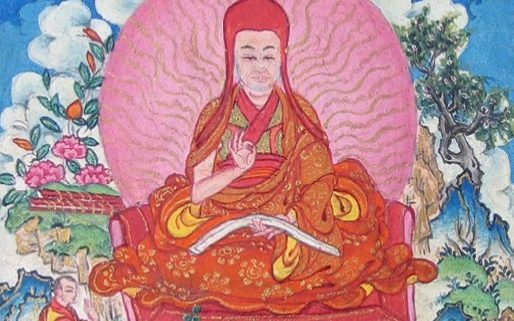 Gyurmé Dechen is known to be a master in the Thanglug tradition of the Shangpa Kagyü lineage as well as a Sakya master. He also received the transmission of the Jonang teachings. 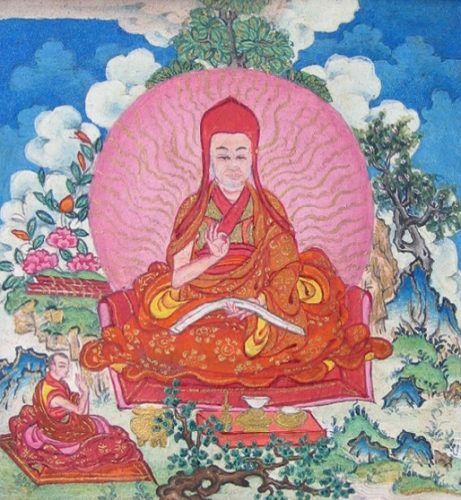 He studied closely with Jetsün Künga Drölchok and Lochen Ratnabhadra (lo chen ratna bha dra, 1489-1563). From these two masters, and others, he received the complete Shangpa Kagyü transmissions as well as the Sakya Lamdré, Hevajra and Kalachakra systems, along with the transmission of the Six-fold Vajra-yogas of Kalachakra. Later he passed on the Shangpa transmissions mainly to his student Khenchen Ngawang Chödrak, whereas the Kalachakra instructions were received by the second Yölmo Tulku Tendzin Norbu. Adapted from: lo chen ‘gyur med bde chen gyi rnam thar mdor bsdus, shangs chos, vol. 1, p. 669-671 (translation from Tibetan by Lama Shérab Drimé).